Much of Austria was starving after World War I, but my widowed grandmother managed to keep food on the table and to share it with boarders. 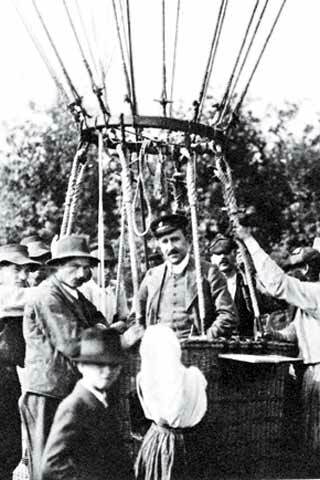 Among the diners was the young theoretical physicist Victor Francis Hess, who had made a name for himself in 1912 as an aerial adventurer, flying a hot-air balloon into the clouds with instruments that measured a mysterious form of penetrating radiation. Hess had concluded that this radiation—later named cosmic radiation— originated in outer space, not in the ground as earlier physicists had imagined. He also concluded that the widow Breisky was an excellent cook. She became Grandmother Hess, and her son, my father, immigrated to America. I was four in 1932 when my father took our family to live in Austria with the Hesses for a year. That’s when I came to know Grandpa Hess. A stout, scholarly man who spoke in a hoarse whisper as a result of radiation poisoning, he loved a good cigar and spending time with his grandchildren. Four years later, Victor Francis Hess was awarded a Nobel Prize in Physics for the discovery of cosmic radiation. By 1938 he was science representative in Austria’s democratic parliament, which had been targeted by the Nazis. He and my grandmother fled to Switzerland, and an offer of a professorship at Fordham University in the Bronx followed. Grandpa Hess died on Dec. 17, 1964—and came alive again for me on Sept. 19, 2007. I had just undergone a procedure called proton stereotactic radiosurgery at the Massachusetts General Hospital. Neurosurgeon Paul Chapman had targeted my cerebellum with cyclotron-generated high-energy protons calculated to halt the growth of a tumor. I asked Juliane Daartz, the German-born medical physicist who had assisted Chapman, if she had ever heard of Victor Francis Hess. “Of course,” she replied, adding that an observatory called H.E.S.S. (High Energy Stereoscopic System), an array of powerful telescopes, has been established in Namibia to search the skies for the origin of cosmic rays. Ethan Cascio, another MGH physicist, told me that the development of the particle accelerators that made my radio-surgery possible was stimulated in large part by what my grandfather had discovered on his balloon flights. That was something to contemplate. So was the fact that my grandfather’s discovery helped lead medical science to a procedure that appears to be extending my life.